Something consistent throughout the works of Erik Skjoldbjærg is an unreliable, or unconventional, narrator. His protagonists often have a distorted view of reality, whether suffering from mental illness or a generalized disobedience of the social order. This, coupled with his tendency to distort perspective, making the reality presented on-screen questionable or problematic, makes for challenging, potentially frustrating viewing, since the audience is never given a reliable framework or traditional sense of moral clarity to edify and appease. This is why Pioneer, a seemingly standard biopic about the Norwegian efforts to extract newly discovered oil deposits found in the North Sea in the early '80s, appears to be a peculiar choice. 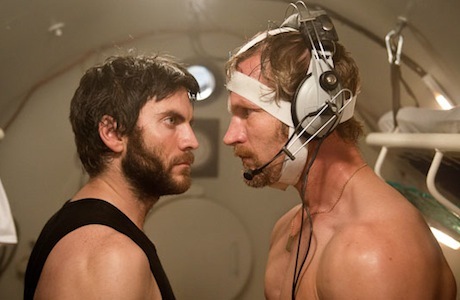 Though, early on, when ambitious blue-collar diver Petter (Aksel Hennie) and his brother, Knut (André Eriksen), are training to be the first men to dive 500 meters beneath the surface of the frigid Sea, there's a disjointed sensibility. When enclosed in a pressure chamber inhaling gas, their laughter quickly turns to delusion, seeing various birds while demonstrating a drunken, incoherent demeanour. Aside from a comment from the Americans ("let us take care of the gas next time"), this diversion isn't given a great deal of context until later in the film, when the alliance between the U.S. and Norway proves to be an endless power play. But before Pioneer turns into a political thriller, an accident during the preliminary dive leaves someone dead and Petter amidst a haze of unanswered questions about what really happened below. The recordings are missing and everyone's stories — his, the Americans, the Norwegians and fellow divers — contradict each other. The perspective on the situation is that of Petter's; it's unclear if the gas used caused brain damage or if the many conversations he has with various scientists and family members are happening as they seem. Skjoldbjærg routinely uses mirrors, distorted images and refracted light to suggest that the reality being presented is askew, which keeps the story vacillating between a straightforward conspiracy thriller and a Beautiful Mind presentation of a deteriorating mental state. Exacerbating the haze of this unreliable narrative is the exaggerated behaviour of American diver Mike (Wes Bentley), whose preoccupation with taking charge and harassing Petter whenever possible are either signifiers of compounding mental illness amongst the divers, Petter's paranoid delusions or reiterations that the Americans are trying to push the Norwegians out of the picture. This less traditional approach to a politically motivated, polemical biopic does help avoid the many traps of the genre. Skjoldbjærg is neither succumbing to structurally uncomplicated and resultantly bland expository regurgitation nor switching around or repressing facts to aid in an admonitory, exploiting historical factoids to construct a commentary on a present social issue. He is, however, playing with the fragile nature of perspective to reiterate the importance of questioning the status quo and the motivations of those with implicit power. As such, Pioneer is stimulating as a psychological mystery. However, it never quite masters or balances the tone or pace of such a balancing act. At times, the story feels like it's going nowhere or, conversely, like everything is too exaggerated to take seriously. This attempt to find an experientially invigorating center amidst reality and a fractured mindset never quite coheres, resulting in a somewhat disappointing film that doesn't successfully screw with the mind or present the severity of its socio-political assertions with the harshness intended.